Don't take the worries of the world with you wherever you go. Rather take this fun little stress ball along in your purse, handbag or briefcase. It will help you relax and calm down after you have squeezed, bashed and smashed it. Our ball is made specifically for that purpose and is strong enough to take a beating. The ball offers the shape of planet earth. It has the oceans and seas defined in a fabulous dark colour and the land masses of the continents marked out in a raised eco-friendly shade. Have fun swirling it around and planning which continent you want to visit for your next holiday. When you are stressed out, bash it around for a while and you will feel better. 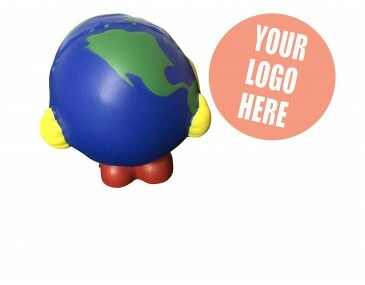 Make your mark globally when you brand your company logo and graphics onto these fabulous stress balls. They make great freebies at trade shows, corporate conferences, school and college events. Any business with an eye on eco-friendly products to save the planet, travel agencies, airlines and internationally operating businesses will create a fabulous advertising campaign with these stress balls. Speak to us, our listed price includes branding of your logo or graphic in a single colour print onto the ball. We offer a product turnaround time of two weeks, but we can offer even faster turnaround times for urgent orders. Please note that our prices exclude GST and a print set up of $75 applies.